Today marks one year of our first two Nigerian Dwarf goats moving in. They were both pregnant and had their babies the same day on Feb. 25. Diamond had four kids, Peanut had three. We retained a couple of the kids for ourselves and introduced a few new bloodlines and went into this next breeding season with nine goats total. All along, our plan was to have up to eight. Whatever your plan is for animals living on your land, double that. This was the advice that we were given and it’s also the advice we would pass along. If I could sum up the last year into one feeling and one photograph, this is it. It brings a huge smile to my face as one year into this journey, I received this photo from StoneRidge Doodles. 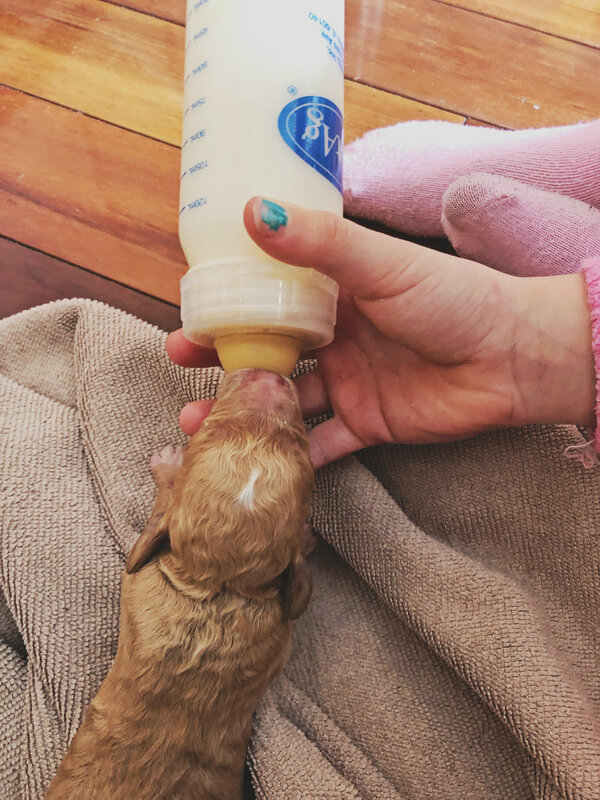 These brand new puppies are drinking a blend of raw goat milk mixed with one of Kenley’s eggs along with yogurt and karo syrup. Golden Doodles are all the rage for good reason - they make the perfect family pet. If you are considering getting a puppy, be sure to check out StoneRidge Doodles, I have seen the work and care care they dedicate to these puppies in the weeks before they go home to their new families.